Our simple Production Line is designed to allow our customer to begin production using a fully automatic block machine for the lowest cost. The production line is fully customisable and can be upgraded with added extras to increase the automation. The batching and mixing system consists of a multi-compartment batching station which automatically weighs and conveys the aggregate to the compulsory mixer. The Fly ash cement then is transported from the silo and Bin feeder used to store the Lime or crusher dust or sand for using a screw conveyor and automatically weighed at the mixer. 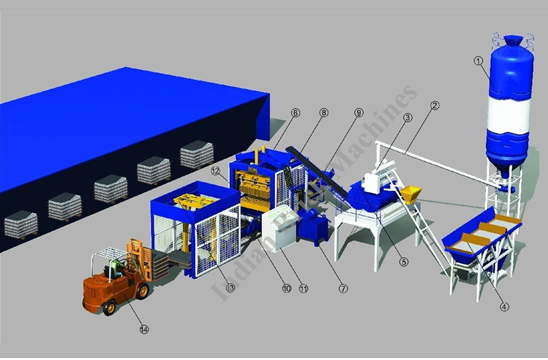 Once the mixer has completed its cycle the material will be conveyed to the fully automatic Brick & block machine system. The concrete is pushed into place by a feeder box and spread evenly into the bottom mould. The top mould is then inserted into the bottom mould and then use synchronized table vibration from both moulds to compact the concrete into the desired block. Pallets of fresh blocks are cleaned and loaded into the Automatic Stacker. The stacked blocks are transported by forklift to be cured depending on a number of factors.